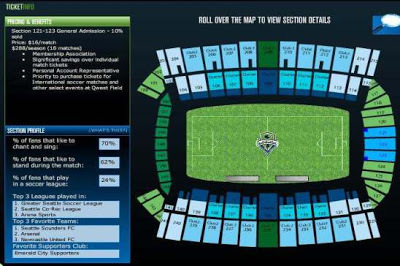 I placed a deposit on season tix earlier this year, and I just got my invite to the Sounders seat selection process. Oh. My. God. For every section, the Sounders give you the price per game and the amenities that accrue to each seat, but also how full the section is, what percentage of people who’ve bought tickets there like to chant and sing, or stand. It tells you who their favorite soccer team is (almost every section picks Sounders FC) and where they play rec league ball. Click that thumbnail to see it in all its glory (obviously, it won’t be functional, though you can see for yourself at tickets.soundersfc.com). I took the screenshot with the general admission section highlighted. It’s only 10% full, which is an anomaly. Many sections–notably the below the aisleway seats along the sideline, are either 100% or 95% full. Another popular area is the $24 seats on the north goal line, which come with food and non-alcoholic beverages included. The seats directly behind goal are nearly gone. Only two sections don’t pick Sounders FC as their favorite team–section 136, along the west sideline, which names Man U (Sounders are 2nd), and 119 on the south goal line, which names the US National Team, then Tottenham, then West Ham. That’s the section I signed up for–those people seem like independent thinkers. You get to rank four sections as your preference, and you can see these stats for any of them. Awesome stuff, Sounders. Bless you. What’s even better is that they haven’t restricted this information to depositers. You can see it for yourself at tickets.soundersfc.com. Click Ticket Info, then If You Have Not Placed A Deposit and you can see all the info that any depositer saw. Sweet. Please report back with any interesting statistical anomalies and, for God’s sake, get tickets now to this organization that obviously knows how to give fans what they want. (See if you can detect the barely hidden subtext). Seth is also an avid tennis player and pickleball player. He wrote several guides to help people chose the right racquet for them.